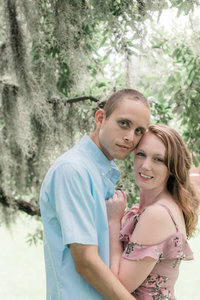 This Castle Hill Cider Engagement Session was so beautiful! We were already in town for a Charlottesville wedding, so we made time to meet with Sarah & Seth for their engagement session. It was our first time at Castle Hill Cider and the scenery there is just breathtaking! We love getting the chance to explore new places with our couples. We had a great time talking and getting to know the two of them better. Seth & Sarah’s first date was on New Year’s Eve where they had Carpe donuts and shared their first kiss! Oh and it was Mother’s Day and we had the opportunity to meet Seth’s parents and nephew! We cannot wait to see them all again this weekend and meet the rest of their loving families! We are so excited to head back to the Blue Ridge Mountains for their wedding at Lydia’s Barn at Evermore Farm! See another Charlottesville Engagement Session!